According to A Dictionary of Japanese Food by Richard Hosking, shiruko is a "sweet soup made from the an of azuki beans with mochi or dango [dumplings] of shiratama added. If the an is not sieved, the soup is called zenzai." 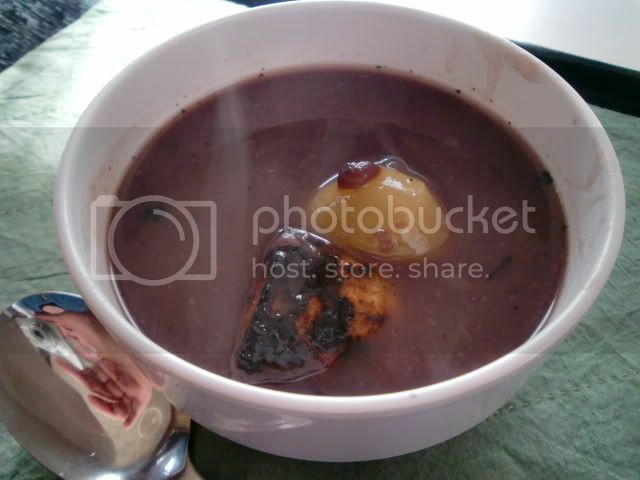 Hosking defines zenzai as "sweet red bean (azuki) soup. Toasted mochi are served in a sweet soup of an. 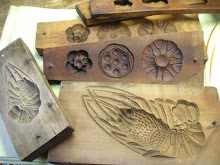 The type of an used varies with the part of Japan." Well, call me an ignorant country bumpkin, but I didn't hear the term zenzai till I lived in the Kansai region as an adult. When I was a child growing up in Hokkaido, we called all soupy an by the name of shiruko. I was congratulating myself on learning the difference at last, when I discovered that in these modern times, traditional definitions often no longer apply. 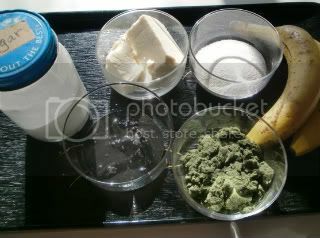 Curiosity led to experimentation, and experimentation led to the three recipes I've posted here. Let's start out with my version of traditional shiruko/zenzai. 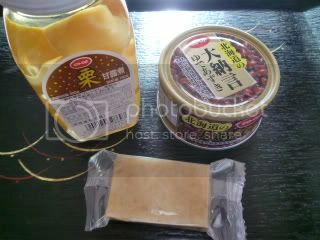 I heat the contents of a can of sweetened boiled azuki beans (or an) and thin it with water to the desired consistency. Meanwhile I grill some mochi on a net over my gas burner. I like brown rice mochi because I find it is more fragrant and flavorful than the white version. And I like to grill it so that it burns a little around the edges. This gives it a pleasant smokey flavor. I spoon the hot azuki soup into individual bowls and plunk grilled mochi into each bowl. To raise the dish to the level of a dessert for a celebration, or for guests, I add to each bowl one chestnut that has been bottled in syrup. So simple! Next, give this refreshing, chilled version of shiruko/zensai a try. 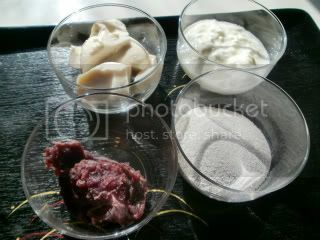 The ingredients are an, yogurt, and shiratama dumplings. Find my recipe for shiratama dumplings here. I use tofu instead of water when I make my dumplings. This produces dumplings with denser flavor that stay soft longer that ones made with water, even after they've been chilled in the refrigerator. I usually make a lot at once, and freeze them in small batches for later use. 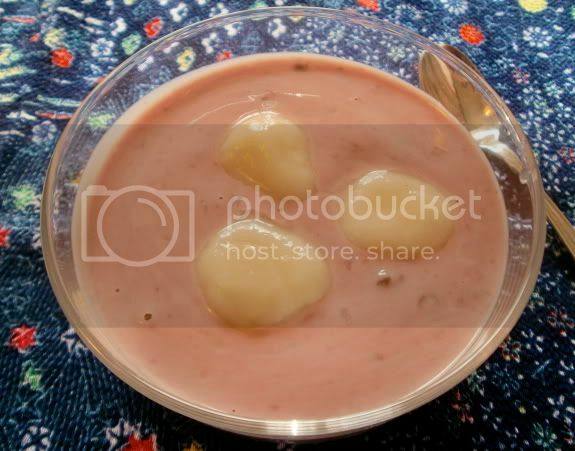 Blend an with yogurt to desired consistency (add sweetener if you must), pour into individual serving bowls, and plop a few shiratama dumplings in the middle. No heating with this recipe. Serve chilled. It has a very pretty pinkish-purplish hue that makes me think of blueberries. Finally, here's a recipe for shiruko that doesn't include azuki at all. 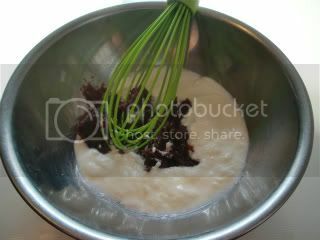 Heat some sesame paste (neri-goma) in a saucepan and gradually thin it out with some milk till you get it to the desired consistency. Add sugar till you get it to the desired sweetness. Blend well. 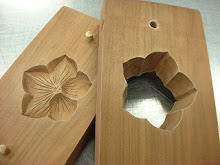 When the soup is smooth and heated through, pour into individual bowls and add sliced bananas and shiratama dumplings. 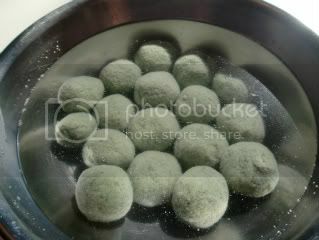 I played with the color combination of this one, using black sesame paste and adding dried yomogi (mugwort) to the shiratama-ko to produce green dumplings in addition to the usual white ones. 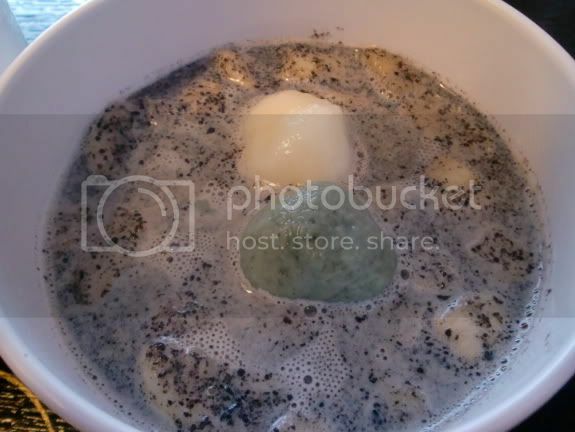 The black-speckled soup with green and white dumplings and yellow banana slices made for an amusing/entertaining/startling shiruko that appealed to my passion for colorful food. This was a big hit with my husband, who is not partial to desserts with an. I haven't bothered with measurements, because the important thing here is the idea of these variations, and you can adjust as you please to make more/less, sweet/not-so-sweet versions of these desserts. Some of you may want to make azuki an from scratch. More power to you. I don't use an enough to make it from scratch myself.